Recently, we examined Three E-Commerce Integration Techniques For Your Forum. The second item on that list is In-Text Advertising. The concept is that certain keywords automatically hyperlink to a relevant page where users can make an eCommerce transaction. This page could link to a page on an advertiser or affiliate site (e.g., Amazon, eBay, etc.) or it could link to an internal page in your own eCommerce store. Make the links obvious so regular users can know the difference between a normal link and an automated link. Make a direct link to a page that opens in a new window instead of a pop up bubble that shows on hover. Limit the use of such links and consider only displaying them to users who are not logged in. Keep the site running fast by ensuring the links non-invasive and do not slow down performance. Track the results to confirm the links are generating revenue. We dislike forums with too many banner ads and typical CPC banner ads are not particularly effective. (It’s better to do a direct sponsorship/partnership, if possible.) However, a judicious approach to In-Text Advertising allows site owners to generate revenue without impeding the user experience by cluttering the site with too many ads. Some key players in this space include Viglink, Infolinks, and Vibrant Media. 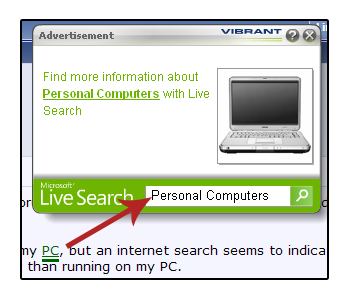 These services typically produce a “thought bubble” with a second link the user must click on to connect to an affiliate site. As noted above (see #2), we prefer to implement a direct link to a new page, instead of the bubble approach which is illustrated in the picture below. And ideally, we’ll link to a catalog page on your own site. So if you need a custom in-text advertising solution for your forum, please talk to us! Above: In-text add example with “pop up” bubble. We prefer a direct link to a page in your catalog instead of a link to an affiliate site and we can help you implement this solution.